Created, written, and drawn by Dan Panosian, 'Slots' #1 is his baby and he has a story to tell at his own damn pace. This beautifully illustrated story is centered squarely on former boxer Stanley Dance and his attempt to find redemption despite being someone without many redeeming qualities. 'Slots' is more of a character study than a rip-roaring crime caper but Panosian's protagonist is a charming cad, full of confidence, capable of swindling you out of a restaurant bill with a devilish grin on his face. He's headed back to Vegas to fulfill a favor he owes. He returns to his old haunts where everyone knows him and knows he must be playing some kind of angle. 'Slots' succeeds because Stanley is so magnetic even when he's a jerk he's interesting. So following him around town meeting up with old friends is still pretty entertaining despite not a lot happening. It's more of a tapestry of characters that fill Stanley's world that we are introduced to in the first issue. At some point, you'll fall under Panosian's spell wishing the story wouldn't end. Panosian's art is distinctive and playful. The scratchier bolder lines make a big impact drawing attention to the characters in the forefront. Every panel feels like it matters which keeps the reader riveted. Facial expressions weigh a lot in this story from Stanley's endless smirks to the eye rolls of his old friends, Panosian conveys so much with or without the written word. I wasn't sure after reading 'Slots' whether I would recommend it or not. Not a lot happens and it's mostly set-up. However, it's Dan Panosian's passion that bleeds through. A lot is invested in the art. There's a deliberate aesthetic he conveys with use of a limited color palette. Reds and muted browns give the book an old-fashioned western feel straight from road pictures from the 50's and 60's. Stanley even tows around an Airstream. Most of all, it's his affection for Stanley and the type of lovable rogue he portrays that is close to Panosian's heart. He's sharing his friends with us like we've been invited to dinner and wants to weave a tale. It feels almost rude not to recommend this series. 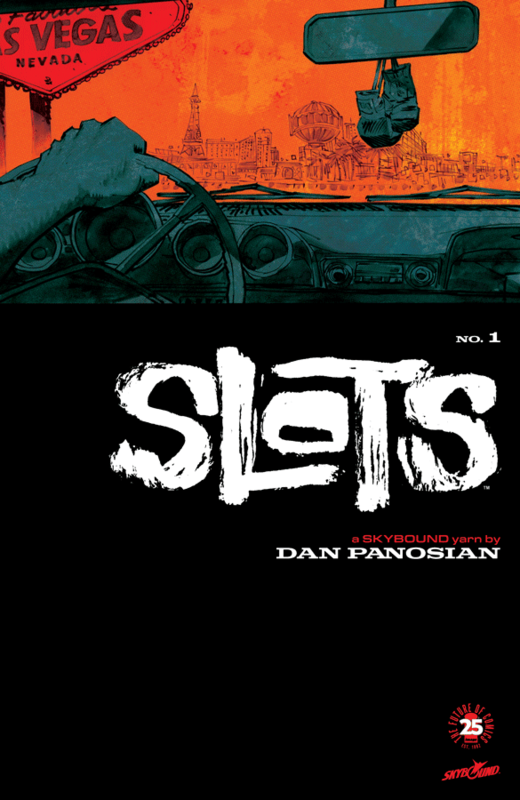 If nothing else, issue one of 'Slots' is worth the read. It may capture your imagination or it may not but there's no doubt it was crafted with love. Panosian is pouring his soul into this story and it would be a crime to miss it. 'Slots' uses classic tropes and that's part of the appeal. You can almost see George Clooney playing Stanley in the film adaptation. We all want creators to care about what they create and 'Slots' is one of those books that leaves everything on the page. Go pick it up. Since this story takes place in Las Vegas and in light of the tragic event that recently happened I thought it would be more appropriate to link to a Go Fund Me page to help the victims than run an ad under this review. Please give what you can. Thank you.